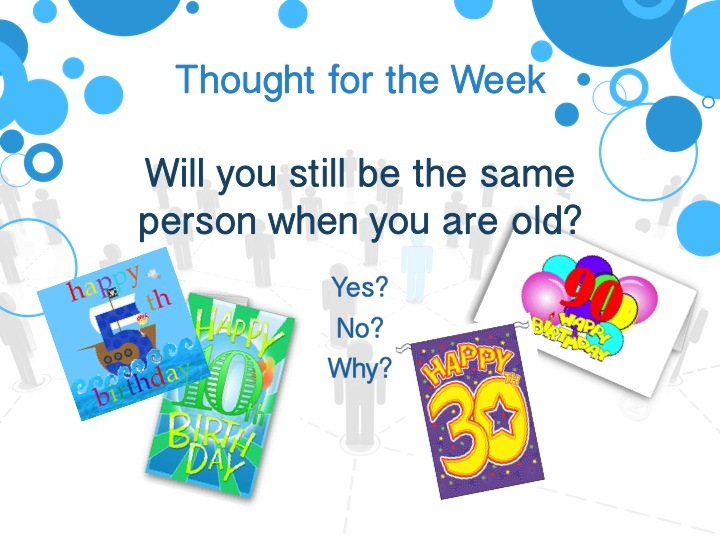 Thought for the Week: Will you still be the same person when you are old? You will be the same person when your old but you will be older than you are now. When we are older we will look different but we will have the same personality. We might not like the things we did in our childhood. Sanjai you are right you might look diffrent but you are the same person. It depends we are not going to switch bodies but our personalities might change and we may not like the things we liked in our youth. I think you will be the same person just old. You are right as well because you might do bad things in your youth and regret it when you are older. I agree Stephanie because you will be the same person but just older. Fatima, that is right, the same person, but different look.